I'm honored, blessed, and ECSTATIC to finally let the world know that I'm one of the newest members of the 2013-2014 Prima Team~!! I can hardly put into words the gratitude I feel in being given this opportunity, and as with anything that I've wanted this badly, I look forward to giving it my all! And as if this experience couldn't be any more amazing, my sister Kelly Foster made the team too~!! Being able to share this endeavor with someone who I've shared EVERYTHING with my entire life makes it ever the more special. Head on over to the official post on the Prima blog HERE~!! Thank-you to all of my amazing followers for your continued support in my scrappy journey, and for celebrating this special moment with me :). I'm blessed to know you all! Its about time! congrats to you & Kelly. I was just asking Cari F. at the beginning of the month if she knew of you. Now she will. Congrats Erin! A well deserved spot! So excited for you! LOVE you, sister :) :) :) Congrats again!!!!!! Stort TILLYKKE til dig og din søster. knus morkaren. Congrats. You work is amazing. Yay! Congratulations, it's so well deserved! Congrats Erin! So happy that you´re joining the team! You´re gonna love Prima - it´s an amazing company and Sharon is just the best!!! Congrats Erin! You will be amazing! Oh Erin, that is FANTABULOUS!! (not a word, lol). I think you & Kelly are PERFECT for Prima, no better match!! Your projects (both of you) Will be as amazing as always. I am just surprised it hasn't happened sooner?? Wonderful achievement Erin. Super cool that Kelly is also a Prima girl. Love that picture of you and Kelly -that is fabulous! Congrats on being a Prima Girl - so well deserved and it was about time - your work is truly incredible ! I'm so happy for you 2 girls!! I had a huge feeling that the 2 of you would make it and I'm just so glad that you both did. It would have been so weird if only one of you had. You girls are like twins!! Very well deserved for you both & you are 100% perfectly suited for it!!! Congratulations Erin! So well deserved! I can't wait to see what you create! This is double awesome and fantastic!! Huge congrats!!! oh my gosh!! I am SOOOO excited for you because I know how much you have wanted this and have worked for it, and to have Kelly with you for the ride, double the fun and blessings, congrats to you my friend!! Huge congrats to you both! You are both such amazing artists and make perfect fits for this dream team :) I can't wait to see what you will create throughout this really exciting year! congratulations to both of you, you deserve it, both of you are so talented, I love your pages. Prima made a great choice! Congratulations Erin!!! Such awesome news!!! Awesome news Erin for you and especially to have your sister sharing your dream with you :) Congratulations!!! SOOOO HAPPY FOR THE BOTH OF YOU..
Oh wow Erin!!! So so thrilled for you. This is fantastic news and so well deserved. Yay! Love the pic of you and your sister. That is way cool. Congrats to her too. I wonder if they've ever had a sister team on the team before??? You may be making history! Grin. Huge congrats to you and Kelly - I've been following her for a while, and can't imagine why I'm not already signed up here too... off to sort that out now, and looking forward to following your Prima adventures. Perfect choices--you and Kelly! Congratulations! Congrats, your work is always beautiful! How exciting Erin!! So happy for your good news, and Prima is definitely lucky to have you on their Team!! 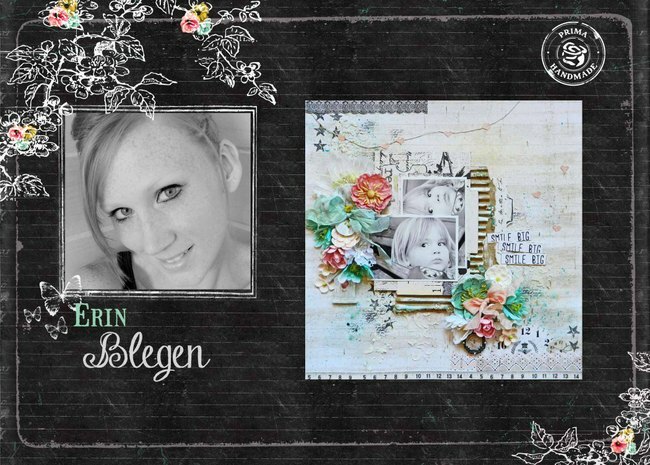 Congratulations to you both on getting on the Prima team, well deserved as you are both very talented and I love to visit your blogs to see your creations. Huge CONGRATULATIONS TO YOU BOTH. Fantastic news for two very talented girls. How wonderful for you and I know you will continue to create beautifully with these amazing products, have a great year!! well done! A BIG congrats! So nice to see that both of you made the team! Yeah! Huge congrats erin - your work is inspirational. prima are very lucky to have you! Congratulations Erin! what an awesome news! !